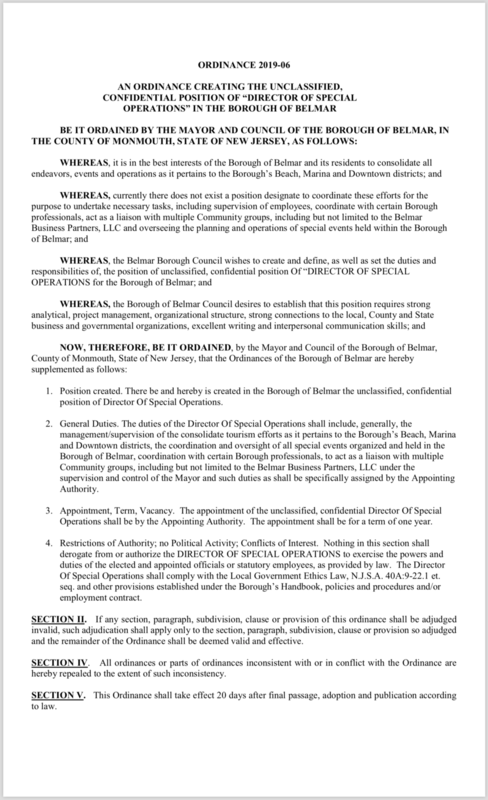 Common Sense For Belmar › Shouldn’t This Be The BA’s Job? Shouldn’t This Be The BA’s Job? You may recall that when I published tonight’s agenda a couple of days ago I mentioned that the ordinances weren’t posted yet and that I was curious to see some of them. They are up now and here’s three that I had wanted to look at. 2019-05, the one establishing salaries, is missing in action. 2019-06 is a doozy. You guys should have a lot to ask about this one. Remember that because tonight will be only the 1st reading you can’t ask questions before the vote. At least you couldn’t when the Democrats ran the meetings. But certainly you can try to find out what this is all about during the public session. What I would say is that if the full-time BA…btw, who remembers when Belmar used to be run perfectly well with a part-time BA?…doesn’t have enough time to coordinate all those wonderful special events and wonderful organizations like Tourism and the SID, and we need to hire somebody else to do it, then maybe we don’t really need to have all those wonderful special events and wonderful organizations. I thought we were poor. This was written by admin. Posted on Tuesday, February 5, 2019, at 5:53 am. Filed under Uncategorized. Bookmark the permalink. Follow comments here with the RSS feed. Post a comment or leave a trackback. I hate smoking but I hate infringing on the rights of smokers even more. Worrying about the rights of minorities(smokers) is why we are a republic and not a democracy. Does that really say “no political activity” ? The whole appointment will be 100% political ! Belmar doesn’t need this. Where are the cuts? Not one single expense should be added without a matching, plus 10% cut. If they’re going to have to raise property taxes, including on commercial properties, won’t that be unfair to businesses that aren’t there under redevelopment agreements? I expect that no matter how much property taxes must go up, nobody is going to be asked to up their PILOT payments. At least, since property owners who are PILOT payers don’t have to pay into Tourism or the SID, the other businesses and business property owners should have relief from those burdens as well. They are just repeating the language in the state law. They have no intention of having smoking areas. Ask “Nickel Bag Murphy” about that “anything”. To smoke or not to smoke, that is the question. Is there any mention of Vapes? Now the BA needs help with this new position. Maybe Colleen was doing a good job after-all and at half the price of the new BA and his new hire? lack of the previous Council doing their job got us into this mess. I say let’s give them a chance.